The trauma of Palestinian displacement in 1948 (the “Nakba”) and defeat in 1967 have been watershed moments in the construction of Palestinian identity. Palestinian cultural expression, whether in film, fiction, poetry, or art, returns again and again to these two historical moments. The work of memory is described here as “performative” in the sense that it creates a shared world and ultimately helps to forge a collective identity. 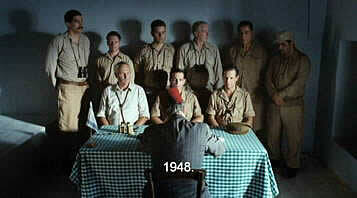 2008 was the 60th anniversary of the war between Arab nations and the newly established State of Israel. Israel commemorates it as the War of Independence; Palestinian Arabs, both Christian and Moslem, know it as Al Nakba, the catastrophe. Over 700,000 people became refugees, fleeing or being driven out into the desert, many with only the clothes on their backs. Before the Nakba, Palestinian society was organized along feudal and tribal lines; its coherence had been successively challenged by the British mandate, Zionist colonization, and the beginnings of modernization. It shared the Arabic language with many other countries. The violence and trauma of the Nakba, and subsequent military victories won by Israel against Arab attacks in 1967 and 1973 have all been instrumental in forging what did not exist so strongly before: a Palestinian identity. The second- or third-generation descendants of those original refugees, whether living in the diaspora, or languishing in refugee camps, in Israeli prisons, in the West Bank, in Gaza, or in Israel itself, identify themselves as Palestinians. The idea of Palestinian nationhood is now increasingly associated with cultural manifestations—in film, in literature, in art, in music—that serve to bind together the sense of a community with common goals. In a poster exhibition commemorating the Nakba in 2008 (that traveled to Harvard University and other places) many of the art works incorporated images of house keys denoting the lost dwellings, of clocks indicating historical time, of the landscape. An art exhibition in Houston in 2003—the first exhibition of contemporary Palestinian art in the United States—also featured a refugee tent inscribed with the names of the lost Palestinian villages, many of them razed to the ground by the Israeli occupiers and renamed in Hebrew. “No Arab community has in so short a period of time—a little less than a generation—reflected so deeply and so seriously as a community on the meaning of its history, the meaning of a pluralistic society given the dismal fate of multiethnic communities in the world, the meaning of national independence and self-determination against a background of exile, imperialist oppression, and colonialist dispossession” (176-177). There is a sense in which the languages of art in all of these cultural manifestations can truly be called “performative,” in the linguistic sense of the word. They are “speech acts” in that they do not merely describe the state of things but rather actively engage the process of redefining the world or creating a new awareness. “not merely at words (or ‘meanings,’ whatever they may be) but also at the realities we use the words to talk about: we are using a sharpened awareness of words to sharpen our perception of, though not as the final arbiter of, the phenomena.” (Philosophical Papers 182). “ordinary usage is … not an aggregate of individual appellation; it is the very attunement of signification that gives us language in the first place, and that enables us to have a shared world in which we live.” (my italics; Loxley 32). In his introduction to Nation and Narration, Homi K. Bhabha analyzes the importance of discourse in the emergence of a national culture (Bhabha 2-4). His use of the term “performativity” in discourse comes close to the way I am describing the uses of memory, in the sense that the recounting or preservation of memory often takes the form of narrative. What I am calling “performative memory” is similar to philosopher Paul Ricoeur’s “instrumental memory,” namely a memory employed in order to establish a claim. This claim, he writes, is always a fragile one because it is assailed by three countervailing forces: that of time, of the counterclaims of others, and of the heritage of its foundational violence (Ricoeur 97-99). As for time as a countervailing force, how can a culture claim to have remained the same across time? And if not, how can it justify the claim to exist as a unique identity? In point of fact, all that anyone can say is that they have remained true to a certain version of themselves that they promise (to themselves, to others) to fulfill. On Ricour’s second point, my claim to be different from others must come from my exclusion from them, perhaps the suffering that is imposed on me from outsiders; therefore my claim to be uniquely human paradoxically comes from the intolerance of others toward me and my own sense of being different from them. Thirdly, Ricoeur writes that “there has never been a historic community that has not originated from the experience of war.” One people’s victorious celebration depends of the defeat and humiliation of those they have vanquished. Collective memory archives real and symbolic wounds and becomes linked to the ideological projects of a given society. Narration is put into the service of instruction, of the commemoration of the originating violence (Ricoeur 104). Ricoeur’s discussion can clarify the way that the ongoing memory project of the emerging Palestinian culture plays an important role in the intifada, or awakening/revival of Palestinian identity. By embodying the experience of exile, loss, oppression, and diaspora, Palestinian cultural manifestations create the shared world that have helped to define what it means to identify oneself as Palestinian today. The outpouring of works in all media can be seen, also, as a vast “memory project.” In the words of cultural sociologist Iwona Irwin-Zarecka, such a project defines “how the past is made to matter: by whom, to whom, when, where, and why” (Irwin-Zarecka 7-8). The forging of collective memory often takes the form of a struggle against others who challenge the new vision; it also creates social bonds, legitimizes claims of authority, and mobilizes action (Irwin-Zarecka 67). “The central fact remains of course: We are a people without a land of our own. But for the first time in our history, one can see Palestinians as Palestinians in a sense producing themselves as they go about their work in a new environment of Palestinian self-consciousness affecting everyone” (Saïd, After the Last Sky, 108). 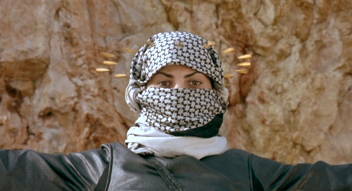 Film has been at the forefront of the Palestinian struggle for self-representation and self-definition. In the process, a unique aesthetic has developed, out of the limitations of space (the freedom to move about) and time (the limited future that many young Palestinians see for themselves). This aesthetic has two contrary movements. On the one hand filmmakers have found original ways of portraying the amputation of time and space in their daily life. On the other hand, the films often represent transgressive strategies of liberation, both in their cinematographic qualities and also often through their female characters. The term “Palestinian film” can be variously defined. 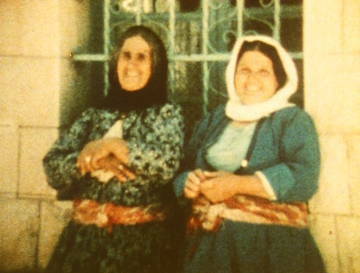 There are Palestinians living in the diaspora (Michel Khleifi from Belgium and Mai Masri from the United States), in Israeli-occupied Gaza or the West Bank (Alia Arasoughly), in refugee camps, or as Arab Israelis within the borders of Israel as they are currently defined (Elia Suleiman and Kamal Aljafari). Then there are films made about the Palestinian situation by filmmakers from other places and backgrounds, some of which will be touched on here. The burgeoning number of Palestinian film festivals all have to deal with these issues of definition—like the Palestinian identity itself, the idea of “Palestinian film” is constantly evolving. The discussion of a specific Palestinian film aesthetic usually starts with Michel Khleifi, born in 1950 in Nazareth and now living in Belgium. He was among the first to argue for a merging of the genres of documentary and fiction, and has long been a key figure in contemporary Palestinian cinema. Khleifi has stated that in either mode (fiction or documentary film), he aims for the primacy of narration, to integrate “drama, theatre, action, and reportage all into one work” (Khleifi in Dabayashi, Dreams of a Nation 49). Drawing on the documentary tradition of direct cinema and the idea, first expressed in the French new wave, that the director uses the camera as a form of writing (the “camera pen”), he has developed a cinema of personal vision and subjective expression. 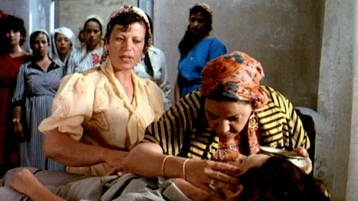 In the 1980 Fertile Memories, the first film to be shot within the disputed Palestinian West Bank “Green Zone,” he portrayed two women: a grandmother, Farah Hatoum, who clings to the hope that her confiscated land will be restored to her by the authorities; and the divorced poet and mother Shahar Khalifeh whose work makes a strong claim for Palestinian identity. In this first work Khleifi already displays what will become a signature of his style, incorporating the landscape by sweeping camera movements that refuse to acknowledge political boundaries. The roaming camera accompanies the poet’s voice, laying claim to the land, and also follows the grandmother who, in old age, sees for the first time the land that has been confiscated from her. “Fertile Memory” refers to the fact that these are memories with a purpose—to move forward into a newly forged Palestinian identity. As such the film contributes both to the project of reinforcing collective memory and of embodying an active, performative memory. 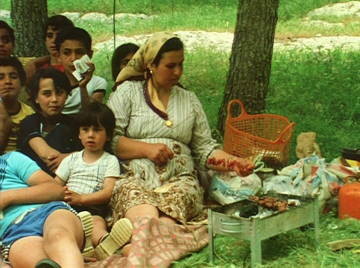 In a film Khleifi produced in 1985 with Perrine Humblet and the Belgian group Marisa Films, Ma’loul Celebrates its Destruction (Ma’loul fête sa destruction) the filmmaker finds a group of elders who gather around a mural depicting their destroyed village—a village they are able to describe in great detail from memory. Once a year on Israeli independence day, the generation of the Nakba and their descendants are allowed to return to the site of the ruined village. There, they try to pass their memories on to their children and grandchildren. Images of the present are intercut with ghostly images of past village life, with documentary shots of fleeing Palestinians in the Nakba, with shots of the refugee camps in 1948, and with shots of the ruined village after the Israelis destroyed it. 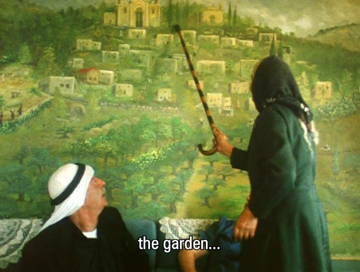 Here again Khleifi not only documents the creation of collective memory; his film is also a work of performative memory—the film is widely distributed in the DVD package of his award-winning feature made in 1987, Wedding in Galilee (Urs al-Jalil). 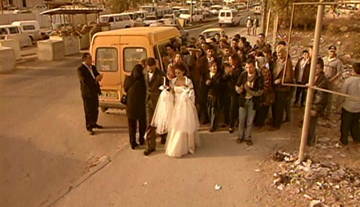 In Wedding in Galilee, the camera pauses in documentary fashion, arresting the progression of the plot to pay homage to the interiors of houses, to the domestic space, even as that space is invaded by the Israeli authorities who have insisted on attending the wedding of the Mukhtar’s (village elder’s) son. At other times the camera traverses closed space in a gesture of liberation. In one memorable scene, an Arabian horse breaks from its stall and gallops into the hills where the Israeli army has planted land mines. The Israeli commander and the Muhktar must then work together to save the animal, in a scene that metaphorically evokes the multiple checkpoints that fragment and divide the Palestinian territory. In this work, Khleifi has stated that he wanted to present multiple points of confrontation: “Israeli/Palestinian, soldier/civilian, power/emotion … old/young, men/women, sexuality/tradition, symbols/needs.” (Khleifi in Dabayashi, Dreams of a Nation 52). 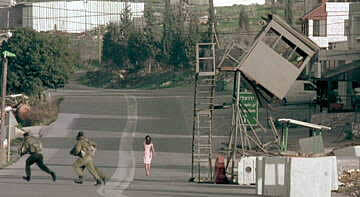 Several scenes combine many of these elements at once: we gain entry into the women’s space when a female Israeli soldier faints and is attended to by the Palestinian women; the broken doll that is presented to the Israeli military guests is a symbol of the Palestinians that they have humiliated and broken but also brings in an ominous note as it is passed from hand to hand before being finally presented to the Israeli guests. The bridegroom who is unable to consummate the marriage on the wedding night symbolizes his feeling of shame at his father’s capitulation to the military governor, while the bride who takes her own virginity portrays the power of resistance that Khleifi has always identified with Palestinian women. 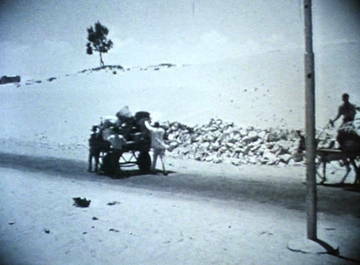 In a three-part work made in 2004, Route 181: Fragments of a Journey in Palestine-Israel, Khleifi traveled with Israeli filmmaker Eyal Sivan along the path of the original border proposed by the UN partition plan in 1947—the proposed border between the two states that has never been implemented. The “road movie” thus documents the erasure of memory rather than its recapture, as all the territory lies within the present Israeli state. Toward the end of the journey, the filmmakers come upon some Arab children who have lost the connection to the Palestinian past and who simply define themselves as Israeli. 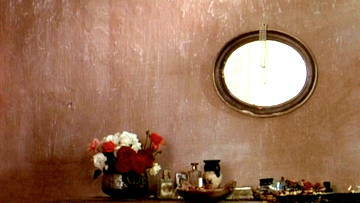 The film captures a loss of memory, but does so in order to restore it. “In a very literal way the Palestinian predicament since 1948 is that to be a Palestinian at all has been to live in a utopia, a nonplace, of some sort…One redeeming feature of the cubistic form of Palestinian life is that it is focused on the goal of getting a place, a territory, on which to be located nationally.” (Said, Question of Palestine 120). The merging of the fictional and documentary modes is apparent in Chronicle of a Disappearance (1997), which presents its scenes with intertitles that flag the events being portrayed as simply occurring on “The Day After” (or in one case, “Days Went By”). 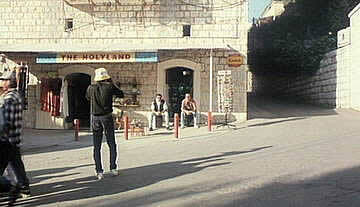 Despite the apparent presentation of anodyne, everyday events, the film has many comic elements: the owner of a “Holy Land Souvenir Shop” patiently fills from a tap little bottles of “Holy Land Water” topped with small crosses; the owner and his friend spend hours just sitting outside the shop while arguments take place in front of them, Japanese tourists walk by without a look (except to take a photograph), and a postcard stand rotates aimlessly in the wind. 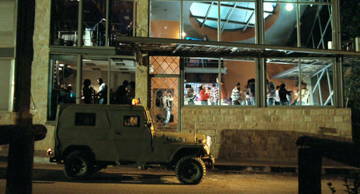 Israeli policemen arrive en masse with sirens blaring, only to stop against a wall and relieve themselves in an ordered row; one of them loses a radio and a young woman, Adan, uses it later to send out orders that manage to get the police cars scrambling from one end of the city to another. When she is arrested she escapes during a fireworks display and the police stuff a mannequin into their trunk as a replacement. The gun on Adan’s desk turns out to be a candle lighter and the grenade-like object is a mug. Her friends are building a “bomb” that also turns out to be a harmless fireworks toy. The director begins a public lecture on Palestinian film (in a section introduced with the intertitle “The Hidden Conscience of Estimated Palestine”) but the microphone won’t work and the audience begins to leave. A chair is upholstered in the colors of the Palestinian flag and a whole room is defiantly decorated in its colors. 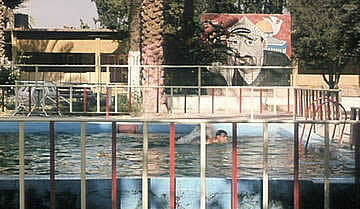 A swimming pool is dominated by the smiling face of Arafat. In his next film, Divine Intervention, the main character (played by the filmmaker) and his beloved can meet only at checkpoints where they are regular witnesses to the arbitrary harassment to which Palestinians are subjected by Israeli soldiers. 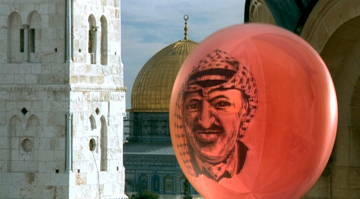 The only escape is a ninja-like battle fantasy in which the filmmaker’s beloved confounds her Israeli attackers—or practical jokes like the red Arafat balloon that he inflates and that traverses the militarized space to the astonishment of the Israeli border guards. In another memorable scene, the filmmaker’s companion stares down the border guards and causes their control tower to collapse. 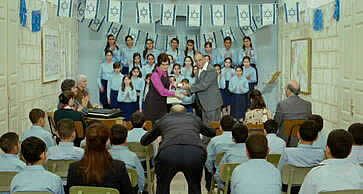 Arab children win the Hebrew singing contest The young Elia berated by the principal: "Who told you America is colonialist? 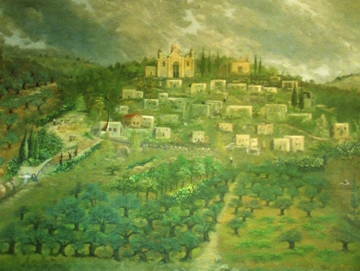 In the flashback, Elia’s father is blindfolded and subjected to a mock execution, during which he listens to the sounds of the landscape and sniffs the odor of the olive trees; here again, as in Kheifi’s Wedding in Galilee, the connection to the earth is asserted over the claims of the occupying Israelis. 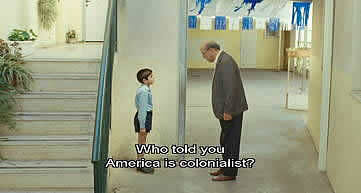 Suleiman’s talent for black comedy surfaces in the scene where a class of Arab students is awarded the prize for the Hebrew singing competition, and another scene in which the young Elia is being berated by the school principal for claiming that America is a colonial power. When the flashback ends and we are back to the present, Israeli soldiers try to impose a curfew on dancing Palestinians youths even as they shake to the rhythm; it is the young Israeli soldiers who are captive in their vehicles while those they seek to control ignore them. 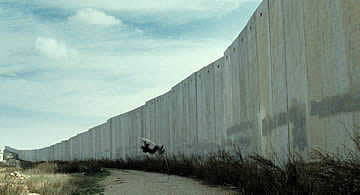 Toward the end of the film, the protagonist polevaults the new Israeli separation wall. “There is nothing on earth more holy than human blood. That is why our country is called the Holy Land” (Habiby 24). Saeed later fathers a son who becomes a guerilla fighter in 1966, one year before the 1967 war. Cornered by the Israeli authorities, he escapes with his mother into the sea. The novel’s third section allegorizes the Palestinian sense of belonging no place: Saeed finds himself on top of a huge stake in the middle of the ocean from which he can’t climb down. His extraterrestrial friend explains that this, in fact, is where he has been all along: stuck in space and time. The circularity is reinforced by the reappearance of yet another Yuad, daughter of the first one, and her brother Saeed. 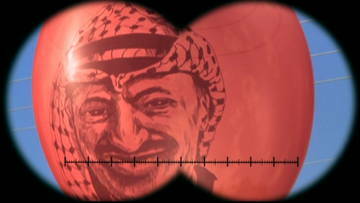 The representation of spatial constriction finds its visual equivalent in Palestinian film. 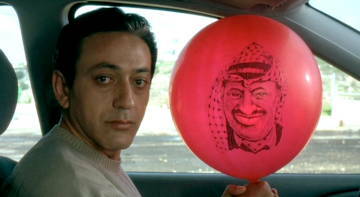 In a recent film by Rashid Mashawari, Laila’s Birthday, there is an additional element of suspense because of the temporal deadline—the protagonist has to get back home in time to celebrate his daughter’s birthday, after dealing all day with the absurdities of daily life in the West Bank. 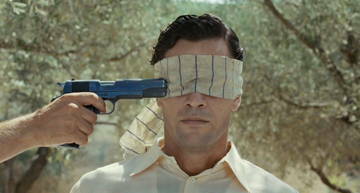 This film presents us with another aspect of the Palestinian dilemma: how to behave ethically in an unethical situation. The director has chosen a judge as his main protagonist—someone whose profession is to make ethical decisions. At the same time judge Abu Leila is compelled to make his living as a taxi driver, and hence represents the everyman character as well. Like Farah Hatoum in Fertile Memory who refuses to sell her land even though it has, effectively, been confiscated, Abu Leila embodies the principle of sumud, of endurance in the face of all obstacles and indignities, of holding on to the land and to one’s identity. 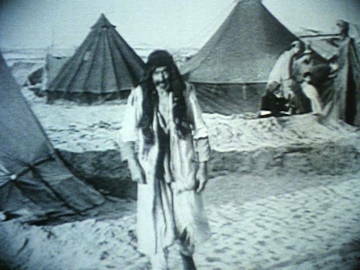 According to Saïd, the concept of “sumud” was first defined by Raja Shihadeh shortly after 1948, as the determination “to stay put, to cling to our houses and land by any means available” (Saïd, After the Last Sky, 100). The judge/taxi driver refuses to travel to checkpoints or to carry passengers with weapons, but he accepts to help those in need. In the process he gives up some of his own goals—such as buying a cake for his daughter’s birthday. At the end of the day he is totally frustrated and grabs a microphone from a truck and begins to try and create order out of the chaos in the streets. He starts out by railing against the drivers in the street and the pedestrians but finishes up by yelling at a helicopter manned by the Israeli occupying forces. He is overpowered and sent home, seemingly in defeat; but when he parks the taxis he finds that the day’s events have left behind their own residue that allows him to save the situation at home. This optimistic ending suggests that “sumud” is the right way. The film is “performative” in that it shows a succession of impossible situations that paradoxically lead to a positive outcome. The protagonist ultimately triumphs over all of the indignities of occupation by behaving in a manner fitting to a just person. In one of the chapters of Palestinian Cinema that he wrote with George Khleifi, film critic Nurith Gertz has proposed the genre “checkpoint films” as a special type of cinematic rendering of the Palestinian experience. 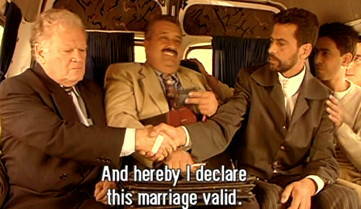 From Divine Intervention to Hani Abu Assaf’s Rana’s Wedding (2002), in which the wedding party resorts to marriage at the Al-Dahia roadblock in Jerusalem, to Alia Arasoughly’s This is Not Living (2001) and Birth at Checkpoint (made for the UN in 2003), this pervasive aspect of daily life in Palestine is frequently addressed in film and video. 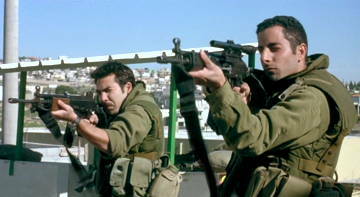 Films made by non-Palestinians also often focus on the checkpoints, which constitute one of the most disruptive and destructive aspects of life for Palestinians under occupation, separating the population from their families, from access to health care and schools, and fragmenting attempts at cultural expression. The short films collected in Hebron Stories: From Bustling City Center to Ghost Town, made by B’Tselem, the Israeli information Center for Human Rights in the Occupied Territories, documents the daily travails of Palestinians trying to remain in Hebron despite the activities of the settlers who have moved right into the city center. Six hundred settlers are protected by thousands of Israeli soldiers, who have closed the main streets and the central market to Palestinians. In one of the videos, a middle-aged woman whose front door has been welded shut by the Israeli authorities traverses stairways and rickety ladders, negotiating a perilous and burdensome passage between the rooftops of her neighborhood to get access to the street. 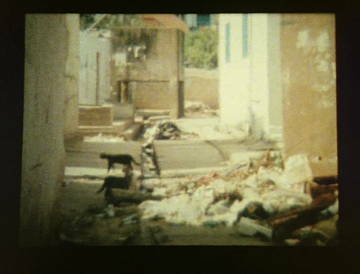 In The Zoo (2005), New Zealand filmmaker Hayden Campbell follows veterinarian Sami Khader as he tries to move two baboons from a run-down facility in Nablus to his zoo in Qalqiliya, a town entirely surrounded by the Israeli separation wall. The hapless protagonist gets denied entry at one checkpoint after another, and is forced to make long detours around the city, all the while fearing that the tranquilizer he has injected into the animals will wear off before they can be put into their new cages. 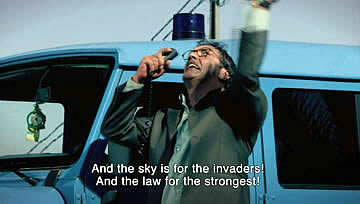 At the end of the film the audience realizes that it is the Palestinians themselves who are also caged. Finally, the soon-to-be-released film Roadmap to Apartheid by South African director Ana Nogueira graphically illustrates how the policies of the Israeli occupation have created a worse situation than that of the reviled system of apartheid in South Africa.